Generally, every baked good I make goes through the same life cycle. I make it because baking is my ultimate form of escape. I focus so hard when I’m baking that all my stresses just melt into the background, and as the pan goes into the oven and I wash the dishes by myself, I just think. And it’s utterly relaxing. I don’t give too much thought to what happens after I’ve finished. So I’ve got an entire cake, or five dozen cookies. Now what? Usually my mom and I eat a little of what I make. She doesn’t have a huge sweet tooth, so she’ll try a small slice or one cookie. I’ll try it too, and if I like it, I might keep some and eat it throughout the week. But this cake. Oh, this innocent looking cake is a completely different story. The first time I made it, my mother was actually shocked to like it. I had only just gotten into baking, and most everything was too rich or too sweet for her taste. But this chiffon cake, light as air and served without frosting, did it for her. Granted, it’s a small cake, but the two of us ate it all by ourselves. I’ve made the cake countless times since, for her birthday and other special occasions. Once, over the course of 5 hours, my mom, dad, and I finished the entire thing. We started by cutting equal slices and carefully plating them, passing around forks. By the end, we tore off pieces of cake and brought them directly to our mouths. No utensils required. Since the first time I started baking, my mother has enjoyed many more of my desserts. At least she doesn’t cringe when I ask her to try something with chocolate oozing out of it. But this cake was still, naturally, the only thing I even considered making for Mother’s Day. Happy Mother’s Day, Mom. I love you. And a happy Mother’s Day to all of you, too. In a medium bowl sift together the flour, baking soda, salt, and 3/4 cup sugar. Set aside. In a large bowl, whisk together the three egg yolks, oil, lemon juice, lemon zest, vanilla, and water. Stir in the dry ingredients. In an electric mixer, beat the three egg whites on medium speed until foamy. Add the cream of tartar and beat on high until soft peaks form, 1-2 minutes. Gradually add the tablespoon of sugar, beating on high for about 3 minutes until stiff peaks form. Stir 1/3 of the egg white mixture into the batter, then use a rubber spatula to gently fold the remaining 2/3 into the batter. Pour into an ungreased 7″ tube pan and smooth the top with the spatula. Bake 45 minutes or until a skewer poked into the cake comes out clean and the top is golden. Cool the cake upside down by inverting the pan onto a bottle. Let cool to room temperature, at least 2 hours, before running a knife between cake and pan and inverting onto a plate. Dust with powdered sugar and serve. 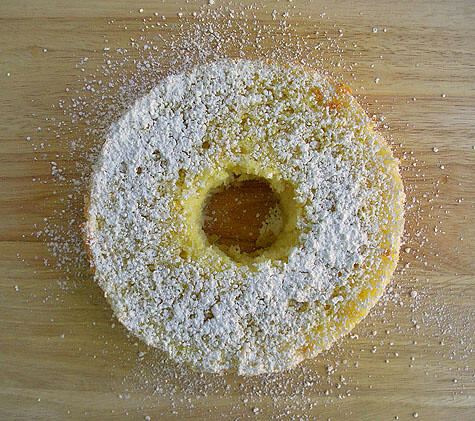 You can also split the layers horizontally and fill with lemon curd, or pour a glaze over the cake. It’s also delicious with fresh fruit or ice cream. Entry filed under: Cake/Cupcakes. Tags: cake, chiffon, citrus, holiday, lemon, Mom. April Showers bring May Migraines – and Cold War Brownies	What’s That? Looks delish, as usual. You’re so close to being done- gl!! No utensils? That’s the best way to eat any baked treat! There really is nothing like a light, airy dessert that you can consume all of in one sitting. Yum! 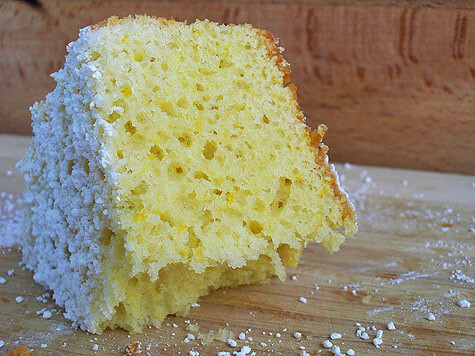 This cake looks very moist, which is nice to see in a chiffon cake. They are usually toward the drier side of things. My favourite kind of desserts are the ones with chocolate oozing out of them, but I know several people who would enjoy this cake much more! 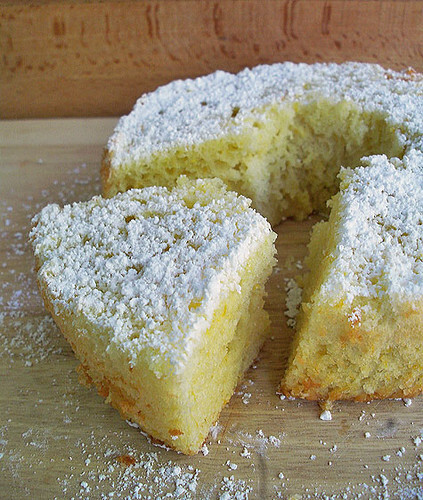 Lemon chiffon cake is one of my new favs… My mom loved it too. She always has to make some comment about my baked goods. Too rich, too crumbly, needs more this, needs less of that… This cake was one of the first things she was like, huh. That’s really good. Keep pluggin’ away at those exams. They’ll be over soon! I’m definitely going to make this one. I LOVE lemon! Thanks for posting this! This looks so good and it doesn’t look to rich which is great! Ok, when are you moving to Australia and stop depriving me of yummies? yum! looks so refreshing! I’ve been seeing lots of lemon recipes lately… not sure if I’m just uber-aware of them, or just coincidence.. but I’m happy for all these new recipe finds! I am going to try this, with orange I think. Pictures are great! You are such an incredibly talented chef AND photographer AND writer: you will surely go far in this world! Good luck with it all, and nomnomnom! Tried it yesterday,was a huge success. Although not lemony enough since I put 1 teaspoon of lemon juice and 2 teaspoons of lemon zest because I read the recipe wrong, it was really yummy and dissapeared quite fast :). Thanks! Tried this a couple hours ago and it was AMAZING! My mother is just like yours and tends not to appreciate anything too sweet or chocolatey – she had 2 very generous slices of this cake! I did not have cake flour so substituted 2/3 C all purpose + 4 1/2 tsp cornstarch to equal the 3/4 needed. I’m planning on baking this for my mom’s birthday in a couple of days, and I was wondering if I could use a Bundt pan instead of a tube pan? Cheery – I think it would techinically bake fine in the bundt pan, but I think it would be difficult to remove. The tube pan I use has a flat bottom, so it isn’t too hard to get the cake out. But a bundt pan, with elaborate designs on the bottom might cause some of the cake to stick. 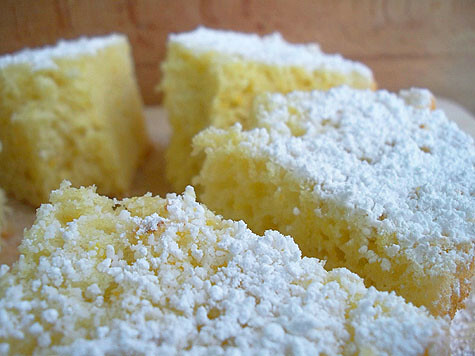 I’ve heard that a lemon coffee cake is good, what do you think? Do you know if I can bake this in a 9 inch springform pan? I don’t have tube pan or angel food cake pan and I’m really hesitant about baking it in a bundt pan since it might get stuck. mmmmmm! We love lemony flavours! Another cake on track! Hmmm can I make this into cupcakes? I made this cake yesterday in a regular non stick pan, but it stuck anyway! Is there a reason that you say not to grease it? Not that I’m complaining – I got to eat the cake right out of the pan! Hi,I tried the recipe but didnt come that good. I used plain flour instead of cake flour. It wasn’t light, it was a bit thick and compressed type. Where did I go wrong? Hi Annie, the problem was likely the plain flour – this kind of recipe needs cake flour. Also, be sure to measure the flour by fluffing first with a spoon and gently filling the measuring up, so the flour doesn’t get too compact. 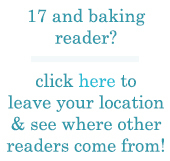 Just curious, do you just have an unlimited amount of money for baking? And if so, how? I love to bake and am in college, but have zero dollars.